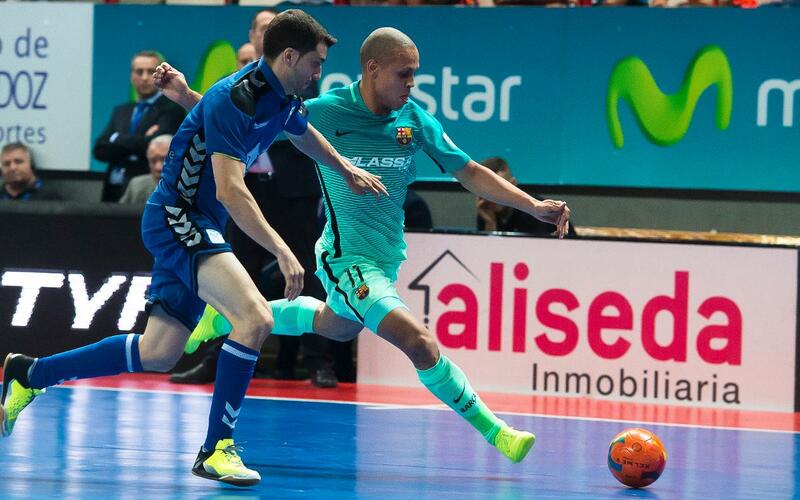 FC Barcelona Lassa secured the first point in the LNFS final play-off. The blaugranas beat Movistar Inter from the penalty spot with a 3-1 win in the shoot-out following a tense 2-2 match which spilled over into two periods of extra-time. Goals from Rafa López and Dyego were not enough for Barça Lassa to get the win in normal time. The game went to extra-time at 2-2 and stayed like that until penalties swung the match in the Catalans favour after a fantastic Paco Sedano performance in goal and cool finishes from Aicardo, Lozano and Ferrao. The first half started with a lot of respect and was very evenly matched as both sides knew how important it is to kick-off the final with a win in the first game. Slowly, Andreu Plaza’s players took control of the match and Ferrao went close with the home team also having chances but lacking the finish. The game remained very tight until Ferrao passed to Rafa López who finished calmly. In the next move, the team from Madrid had two gilt-edged chances to level the scores but the blaugranas clung onto their lead until the break. Barça Lassa started the second half with intent and a fabulous Dyego free-kick gave them a two-goal cushion after 22 minutes. The strike was the Brazilian’s 29th of the season and his team were cruising until Daniel pulled one back from a corner making it 2-1. Movistar Inter responded and they put Barça under increasing pressure. The blaugranas clung on and even had some chances of their own through Ferrao, Dyego and Joao. With only fifty seconds to go Rivillos scored a cruel equaliser. The scoreboard didn’t change again and the game went to extra-time. After two intense periods of extra-time both sides were unable to break the deadlock. So, penalties were needed. Sedano stopped one and Aicardo, Lozano and Ferrao all converted theirs to give Andreu Plaza’s team the opening victory in the best of five final. The second match will be this Saturday 10 June at 1.15pm CET before they return to the Palau.